Pinterest and you’re sure to pick up on the trend: cooking is cool, and nothing could be cooler than making an at-home bone broth. Learning to make your own bone broth seems like a very advanced cooking technique, but in fact, the process is quite simple. Even the most novice of chefs can handle a bone broth recipe. But what’s the big deal with bone broth? What’s making it so trendy and what health benefits does it really offer? In this article, we examine everything you need to know about bone broth. No need to wonder is bone broth good for you--in this article, we’ll answer all of your burning bone broth questions once and for all. Before we go any deeper, let’s establish a few base facts. What, exactly, is bone broth? How is it made and how is it used? Essentially, bone broth is pretty much what it sounds like: the broth that’s a result of brewing or stewing bones. Broth or stock, though they are two different things, both serve as the basis of many soups, and both are made from simmering together animal elements to pack a rich, nutrient-packed punch. Even our hunter-gatherer ancestors realized that drinking bone broth was like striking nutritional gold, as its earliest version dates back over 2,500 years. Throwing away anything edible was out of the question back then, so animal hooves, knuckles, bones, and other connective tissues never went to waste. Bones and connective tissue are storehouses for essential amino acids and minerals — which are lacking in many diets today. Bone broth is also an invaluable source of protein, collagen and gelatin. … Collagen is also found in your bones, joints, tendons, muscles, and teeth. So, clearly, there’s a lot to the simple liquid we know as bone broth! What’s generally not given a second glance, as it’s just the base of soups and other dishes, actually has quite the long list of accomplishments on its own. It has a lot to offer in its simple, drinkable form! What’s more, in order to make your own bone broth, all you need to do is simmer bones and tissue together for an extended period of time. It’s fully customizable, too: you can make beefy bone broth or a flavorful chicken bone broth. Really, you can make bone broth from virtually any type of animal that has bones! Typically, you’ll cook the bones of the animal of your choice together with vegetables, herbs, spices, and other flavorful additions that add to the richness of the taste and also contribute an extra punch of vitamins and nutrients. In other words: “What sounds like meat water is pure, liquid gold.” The nutritional content provides a lot of vitamins, so it can help provide energy and all sorts of other desirable effects. So, are you convinced and ready to try it for yourself? Before we get too far, let’s take a closer look at the health benefits of bone broth and determine how bone broth is truly good for you. What are the benefits of eating (or, rather, drinking) bone broth? Is bone broth good for you? And in what ways? In this section we’ll explain some of the purported benefits of brewing your own DIY bone broth and consuming it as a regular part of your diet. What’s not to love? The potential benefits of consuming bone broth include losing weight, looking younger, and feeling better. Who wouldn’t want a cup -- or a bowl -- of that on their table? Thus, bone broth offers a slew of potential benefits in one simple and easy to make, easy to eat food staple. But its benefits aren’t solely nutritional. What’s more, it’s accessible to nearly everyone and helps to utilize the greatest amount of food possible, aiding in eliminating unnecessary food waste and providing the biggest bang for your buck! For example, buying a whole chicken and then using every part of it, including its bones and tissues (which most people tend to throw away), helps you stretch your money farther and get the most out of the food items you invest in. Bone broth began trending for a reason: nutritionists and doctors the world over are willing to sing its praises and recommend it as a healthy and power-packed superfood. However, some disagree with the claims that bone broth is a healthy or beneficial part of any regular diet. Though bone broth, like all trendy foods, does have its naysayers, we’re willing to keep drinking such a delicious and lovingly prepared homemade soul food. 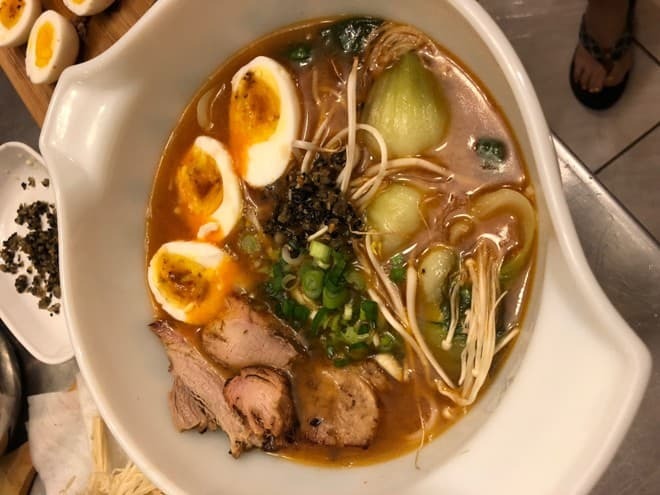 Try to turn down a bowl of steaming ramen made with three-day-simmered bone broth on a chilly winter night! It promises to warm you and nourish your body from the inside out. Bone broth usually arrives to your diet in the form of a soup or stew, but you can do a lot of other things with it, too. You can blend it into foods like protein shakes or smoothies for an added nutritional punch, or you can even use it as a salad dressing, condiment, sauce, or side. You can also mix it into other breakfast foods like oatmeal or yogurt. Bone broth has been around for thousands of years, but it continues to grow more widespread than ever. If you don’t already have a recipe for it passed down from your grandmother or mother, the Internet is a foolproof place to find one. Too lazy to make it at home? You can even buy bone broth on Amazon! Still, when it comes to a food that warms you from the inside out, nothing beats letting it simmer and bubble on your kitchen stove and filling your house with the aroma of a freshly prepared and home cooked meal. So, when you’re ready to embark on the world of make your own bone broth at home, here’s an ultra-simple go-to recipe you can trust and turn to again and again (from HealthLine). To make the bone broth, you’ll simply place all of the above ingredients in a large pot or slow cooker and then bring it to a boil. Once it reaches boiling point, reduce it to a simmer and cook the concoction for 12 to 24 hours, or even longer if you so desire! The longer you cook your bone broth, the better the final product will taste, and the more nutritious it will be. When you’re finished, simply allow the broth to cool and strain it into a large container. Discard the solids. Of course, once you have this super-basic recipe down, you can step it up as you please and add vegetables and other elements. Popular additional ingredients include celery, carrots, onions, parsley, garlic, and whatever herbs and spices suit your fancy. Hold up a minute… where do you find bones? As you take a look at the recipe, you may start to think that sourcing the main ingredients of the recipe is going to prove more difficult than the recipe itself! Depending on where you live, you may not be able to simply purchase a set of bones at your local grocery store. But not to worry, they’re easy to acquire. You can save leftover bones and carcasses from meals you make instead of throwing them in the garbage, and this is a great way to access and stock up on bones. You can collect and store the bones in your freezer until you have enough to make a hearty bone broth or until you’re ready to use them. Another idea is to inquire into leftover bones or bones for purchase from your local butcher or farmer, who may be just around the corner at your local farmers market. Best of all, they’re extremely low priced! Once you’ve made a big batch of bone broth, you can store it for a while, too. It will keep in the refrigerator for up to a few days, and after that, you can store it in your freezer. This is ideal if you want to make a big batch of bone broth once but then have smaller portions easily accessible for you to take out and defrost as you need them.